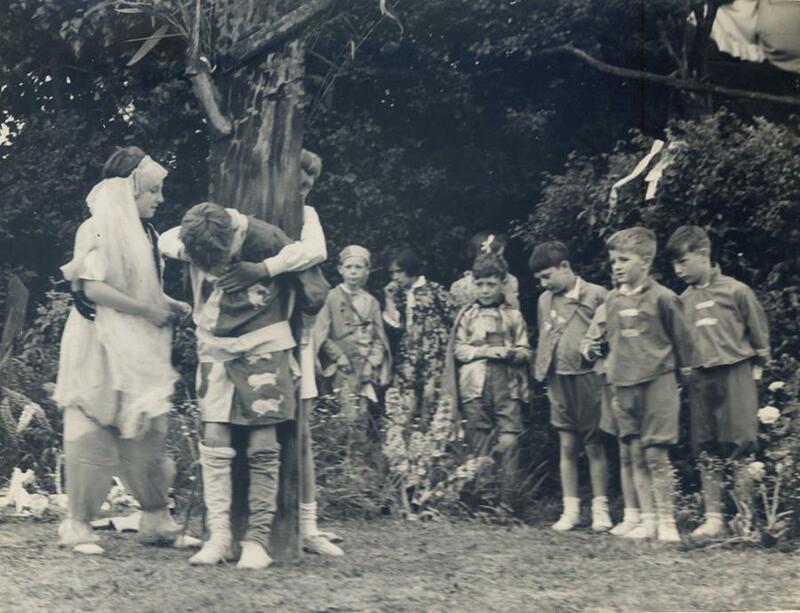 NOAK HILL SCHOOL PHOTOS 1935-39, 1946 & 1968/9. Thanks to Jean Peacock and her daughter Gill Odling for making the earlier set available to The Friends of Dagnam Park. And to Colleen Mason nee Milsted who provided the 1946 picture and the associated memoir. 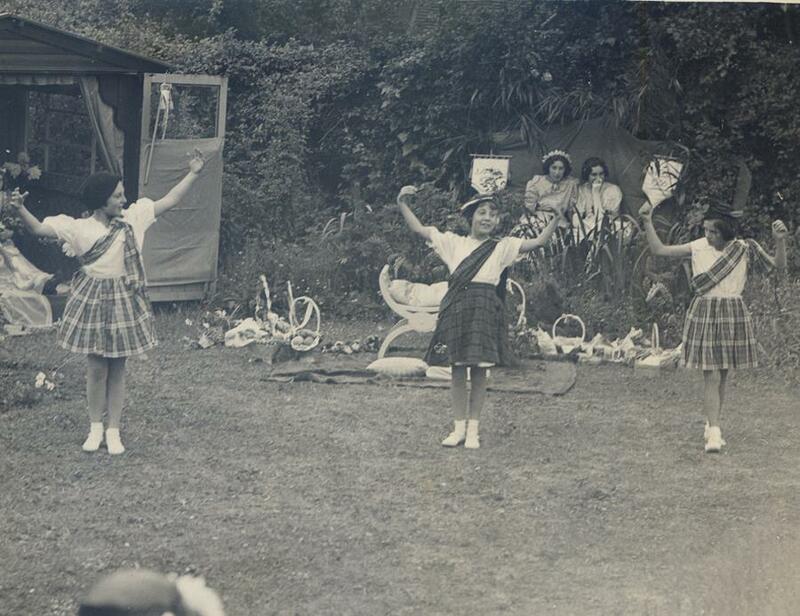 Finally we are grateful to Angela Beecham nee Bell for the set taken in the 60s. 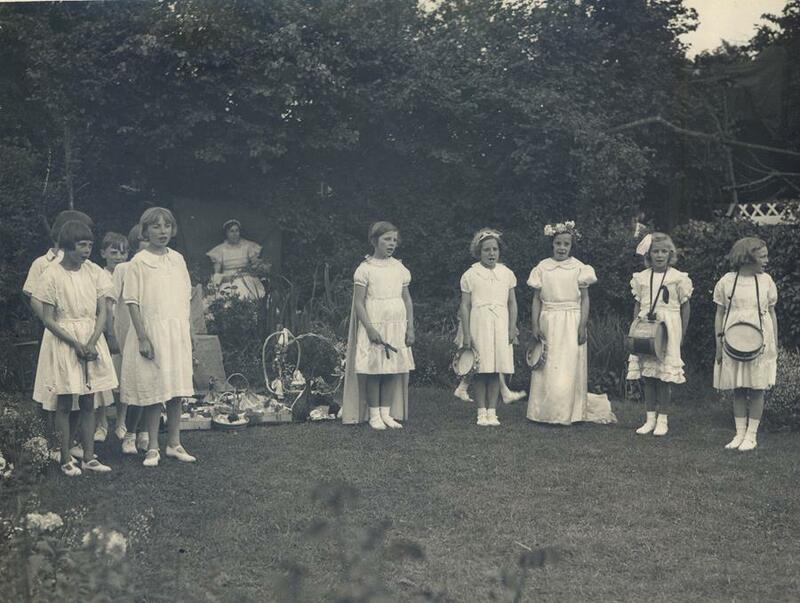 With thanks also to Joan Shave (nee Lodge) who provided additional information on the children featured. Continue down for the Noak Hill School photos or click here to go straight to the final set of photos which are mainly set in the Straight Rd School in the 1940s. Noak Hill School photos can be downloaded here if you prefer. It will be much appreciated if anyone recognising themselves or any friends or relatives will let us know. Marjorie Jean Peacock, always known as Jean was born to James and Florence Gladys Peacock, nee Vaughn on the 15th March 1930. She had one sibling, a brother, James Fredrick Peacock who was born on the 13th November 1926, and he died on the 18th November in 1996. James served with the British army during the 2nd world war. He was stationed in Puna in India. He was married to Barbara Clarke and they emigrated to Canada about 62 years ago in 1953. 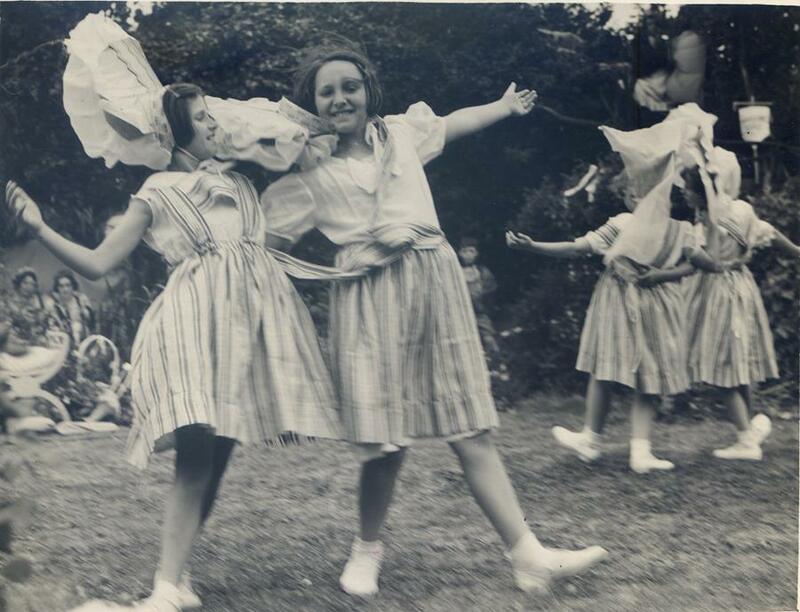 Jean started her schooling as an infant in 1935 and spent her early school years at the Noak Hill School. 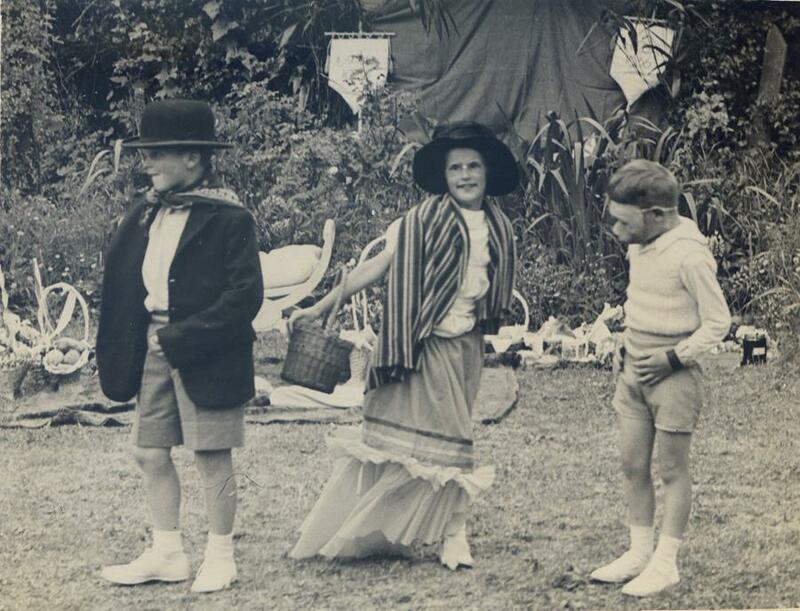 The head teacher of the Noak Hill School from 4th June 1928 to the 27th November 1939 was Miss C. Mardall. Miss Violet Hutchison was latterly a senior teacher. They both transferred to the Straight Rd School at the same time and Miss Mardall became the new school’s first head mistress. 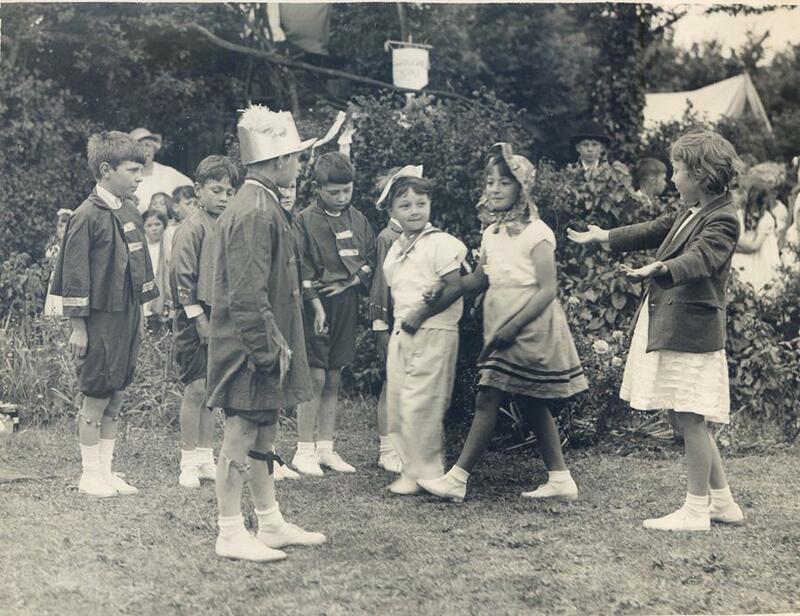 In a school inspection of the Noak Hill School in July 1940 the inspector stated. "In number this is a sadly depleted school, more than two thirds of the children having been Transferred to a newly built school. There have also been numerous changes in the teaching staff during the year. However in spite of the difficulties the present teacher is carrying on the school on the excellent lines on which it has been carried on in the past and which made it one of the best schools of its type in the district. The children answered the questions asked them, readily and well. The written work was neatly and carefully done. Repetition was good. 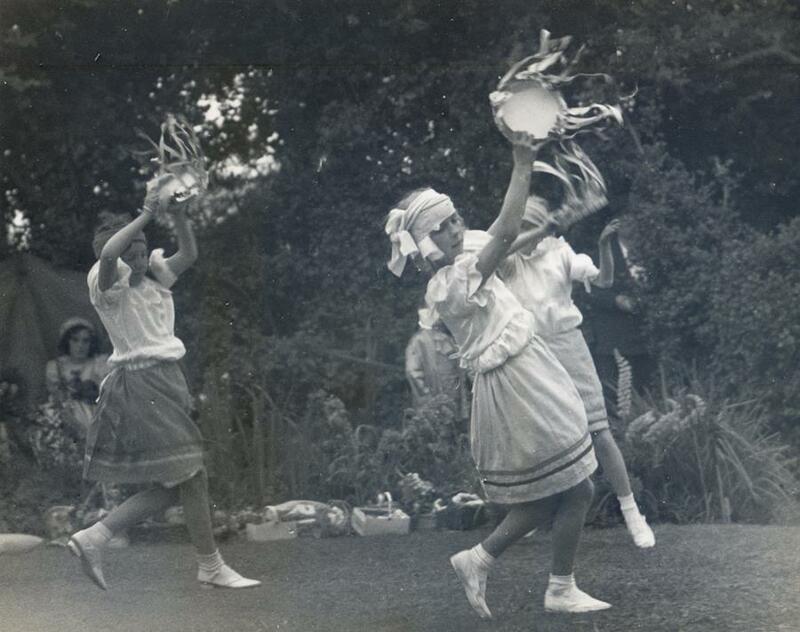 I hope that when the school has settled down under its altered conditions it may still maintain the splendid traditions built up during Miss Mardall's leadership." Infants. Margaret Spett (certificate). Older children. Angela Thirkettle (3rd endorsement), Jean Peacock & Alfred Jones (2nd endorsement), Doreen Luffman, Evelyn Holmes, Pauline Galpin, John Papps, Dennis Potter, Norma Papps, (new certificates). Deserving mention Elsie Ottley" M.W. Smith. Diocesan Inspector. Jean maintained contact with her former teachers and by coincidence all three ended up living in Maylandsea in Essex many decades later. 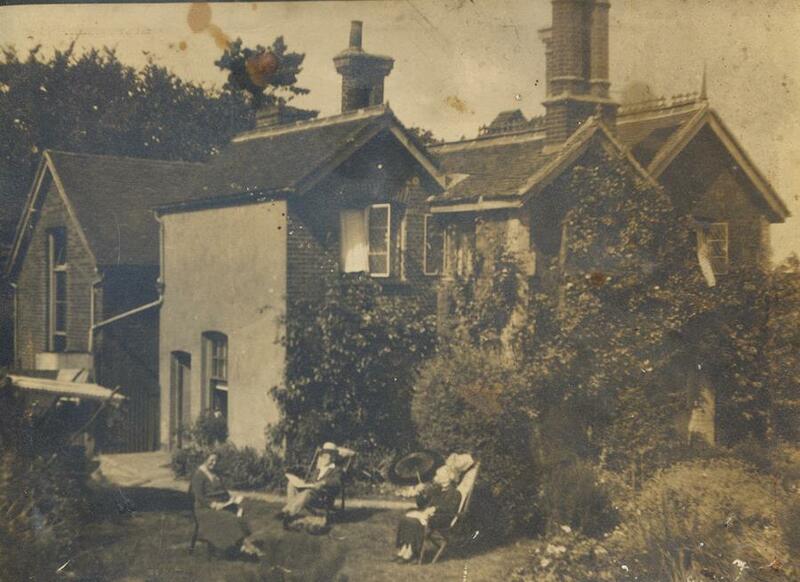 Miss Mardall and Miss Hutchison had lived together there in retirement for some years. Neither had ever married and on Miss Mardall’s death Miss Hutchison moved home before she too died in late 1981. Jean enquired about the photo albums which she was aware of and she was given them by “Deaconess Ethel” Jean then cared for the four albums up until now (2015). 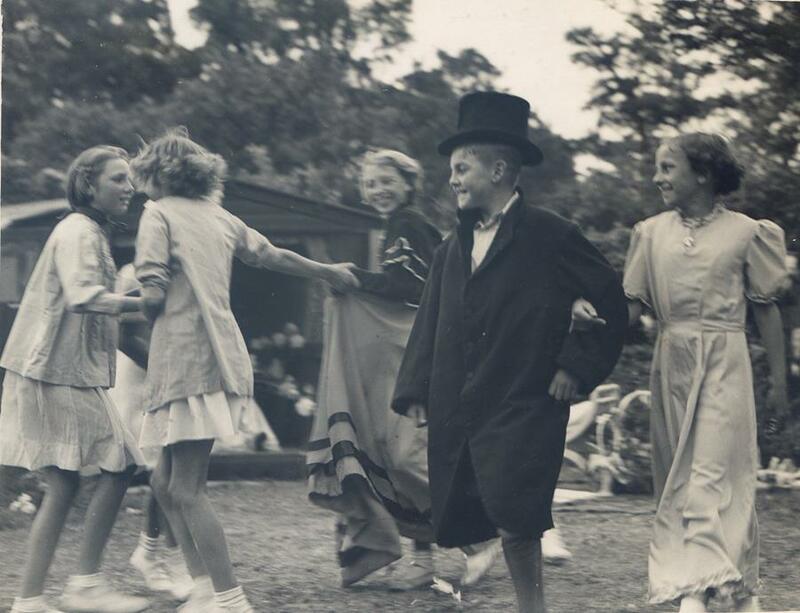 In May 2015 Jean’s daughter, Gill, contacted us through this website and we were delighted to agree that the photos should be made freely available to all by adding them to the Noak Hill School pages and linking them to the School log books. She then sent the albums to us. I have now digitised all of the almost one hundred images and many of the photos can be seen below. This is work in progress and Gill is currently working with her mother in extracting as much information as is possible about the photos from her mother’s lucid, albeit, eighty year old recollections. 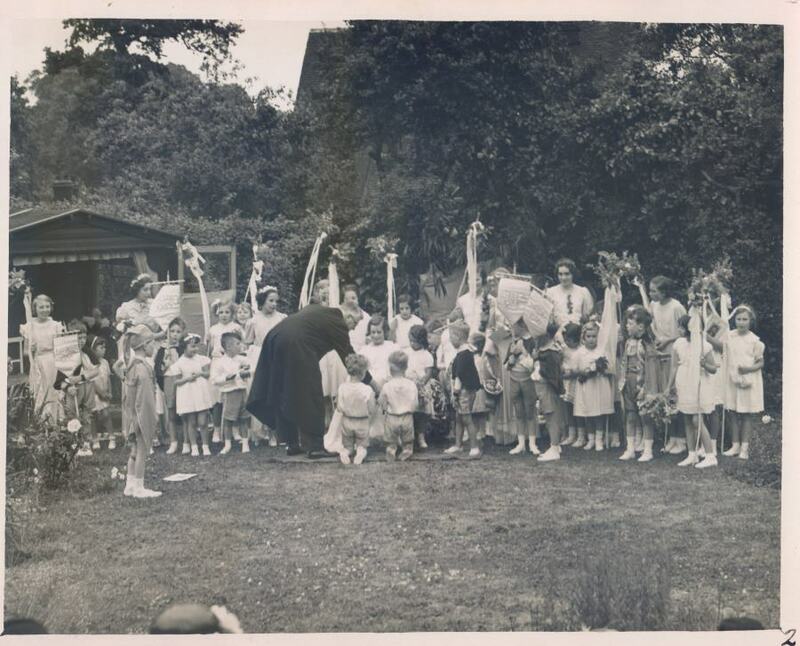 During Miss Mardall's headship she encouraged May Day ceremonies. At least seven such ceromonies took place, annually from 1933 to 1939. 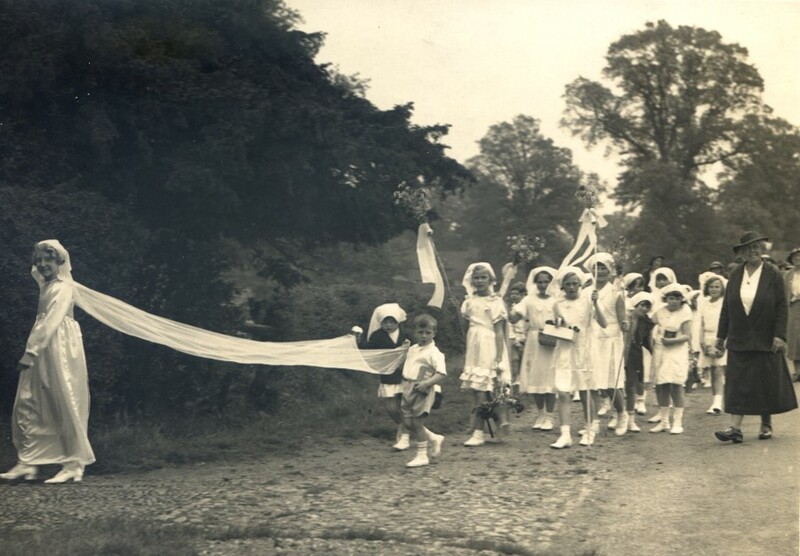 She continued the tradition after she moved to the Straight Rd School. She died in Maylandsea in 1966. The photos below are captioned with as much information as we have. 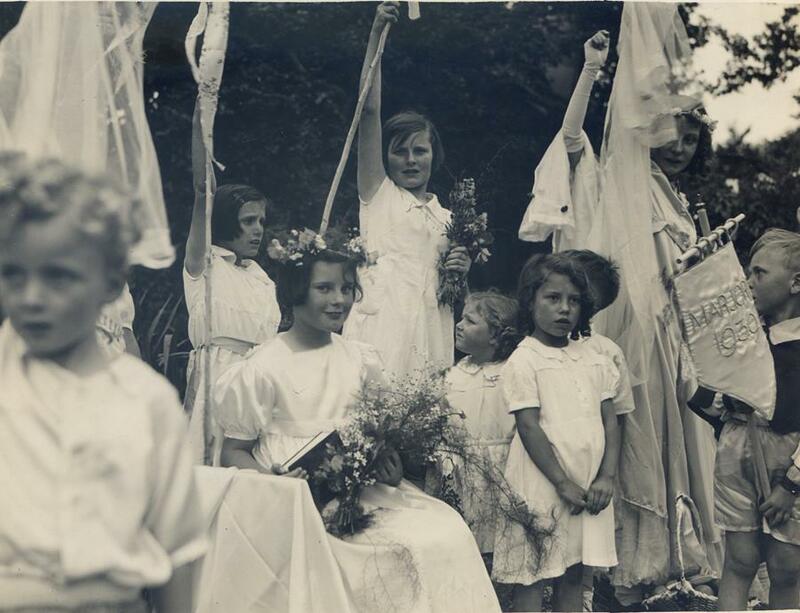 They focus mainly on the May Day celebrations in 1938 and 1939. Below is a list of the May Day Queens that we know of. 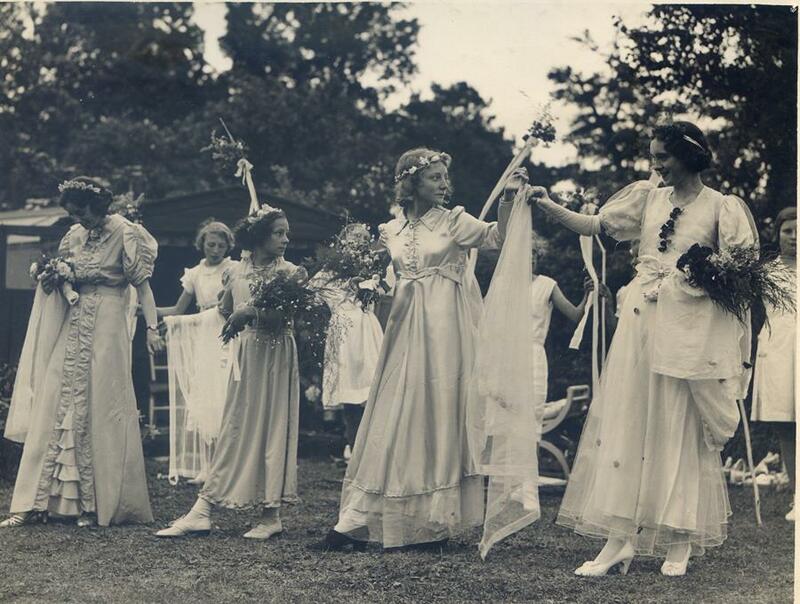 May Queens from 1933-1939. Names in brackets are uncertain. 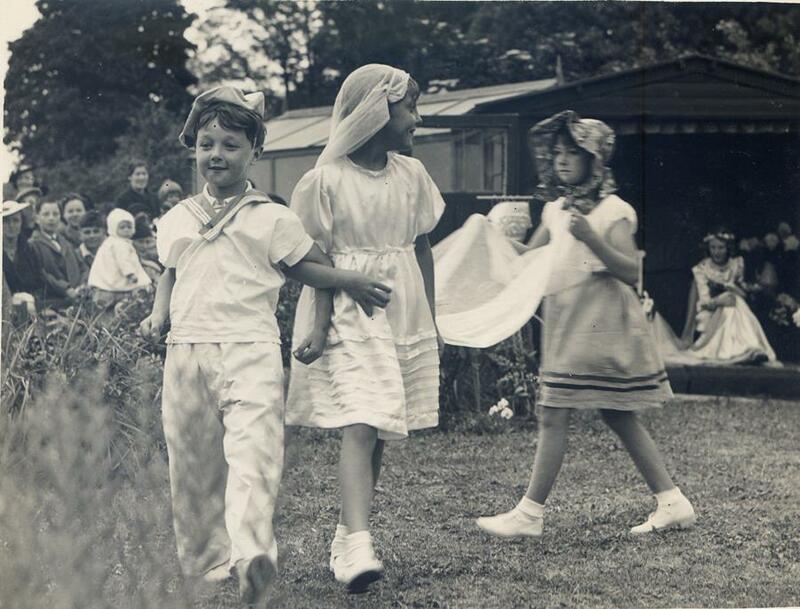 The school log book states that on 24th Nov 1939 "Miss Mardall, Miss Hutchison, Miss Jones and Mrs. Peacock (cook) this day relinquished duties at Noak Hill School." 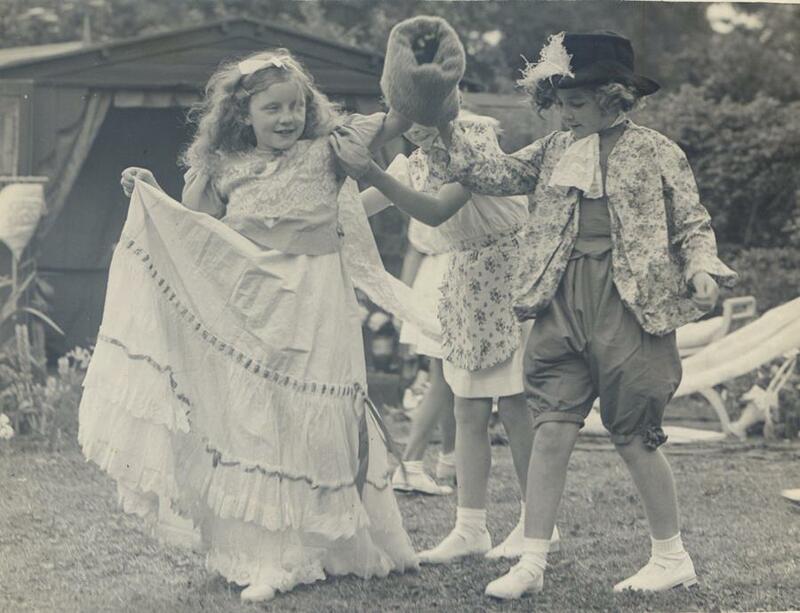 It is uncertain as to whether Miss Jones and Mrs Peacock appear in this photo. During her headship at the Noak Hill school Miss Mardall almost certainly lived for some time in The Schoolhouse. Miss Mardall's parents lived at Kynance near The Bear PH. 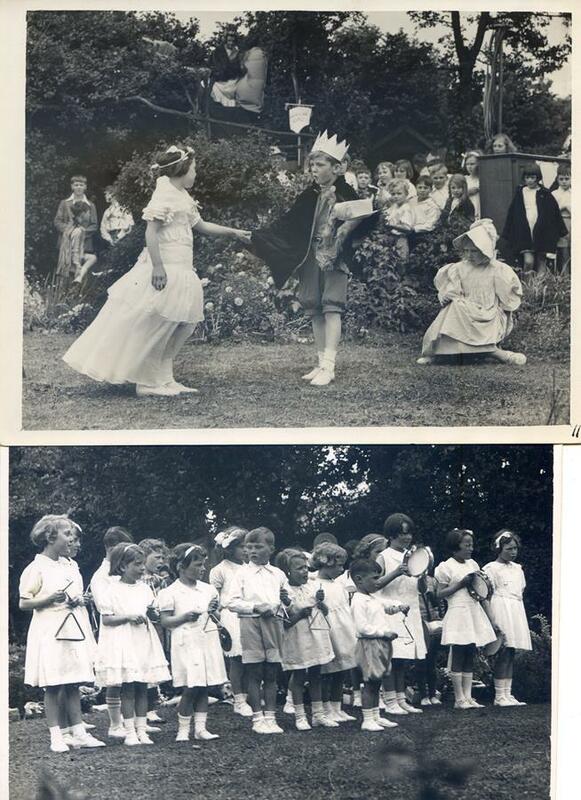 From at least 1951 to 1963 Miss Mardall & Miss Hutchison resided at 13 The Mount (Thornhill) but by 1964/65 they had moved out. Catherine Grace Victoria Mardall was residing at Arkerdine, Imperial Avenue, Maylandsea, Essex at the time of her death at the Chelmsford & Essex Hospital Chelmsford on 25th November 1966. Violet Helen Hutchison died on 5th July 1981 either in the Chelmsford District or in Chelmsford itself. At the time of her death she was residing at a property called "Wykeham" East End Road, Bradwell on Sea, Essex. She was born in 1899. Thanks to Don Tait and the LBH Library Service for this research. 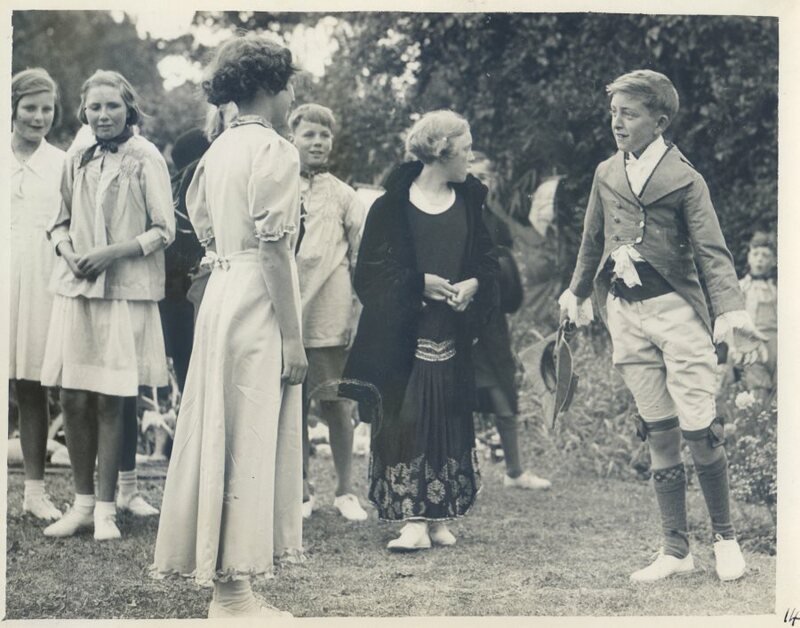 1A; James Peacock, right, Margaret Hollick in black. Three others all probably the Guest family. 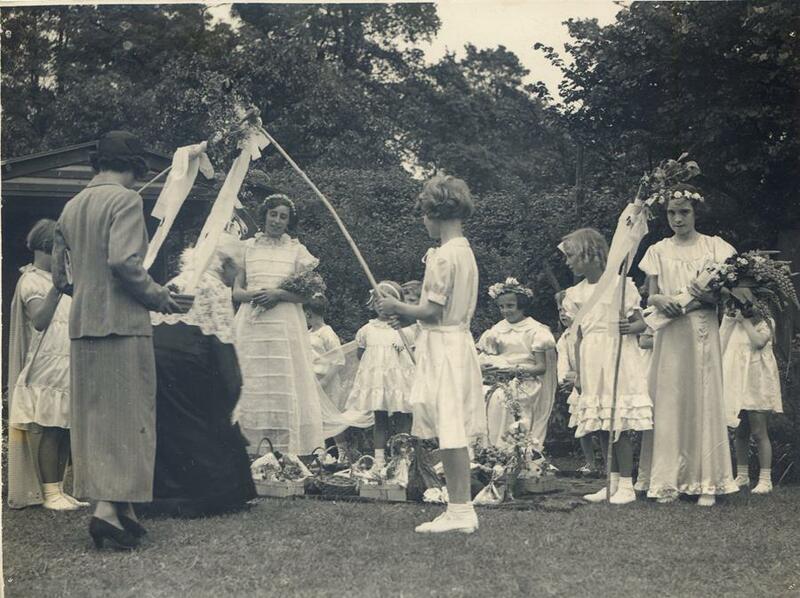 2; Joan Lodge is the May Queen, centre, Maids of Honour with flowers are left, Mabel Enkel and right, Iris Fogg. 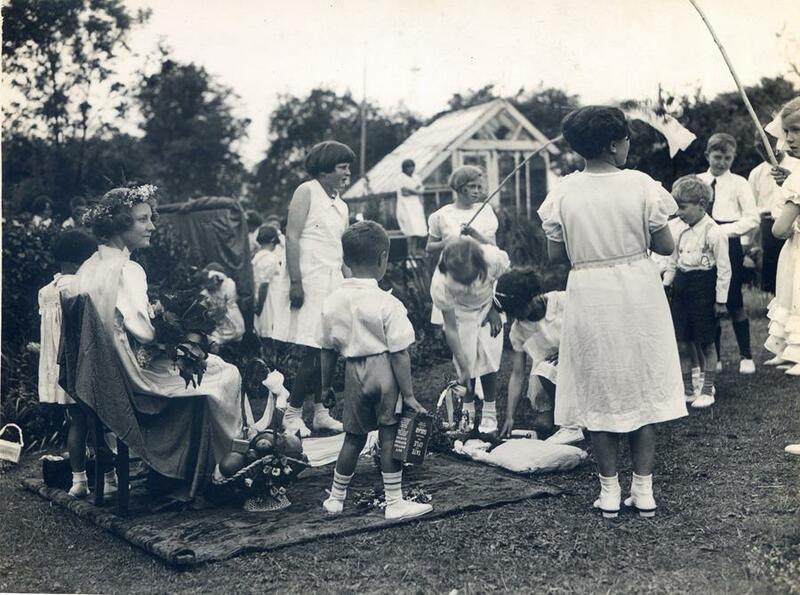 The tallest girl in the rear is Hilda Mumford. 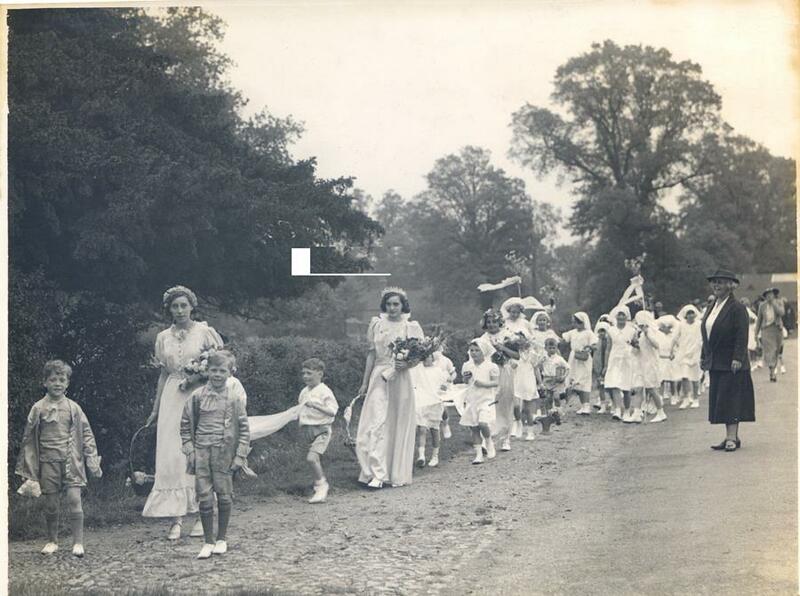 6b; May Day procession from the school to the church. Stella Rawlings is the May Queen. 10; Mabel Enkel, below the arch. Joan Lodge, seated. 11; Stella Johnson seated, Marjorie Guest, tall, in front of and to the left of Stella; James Peacock far right of photo with black tie. 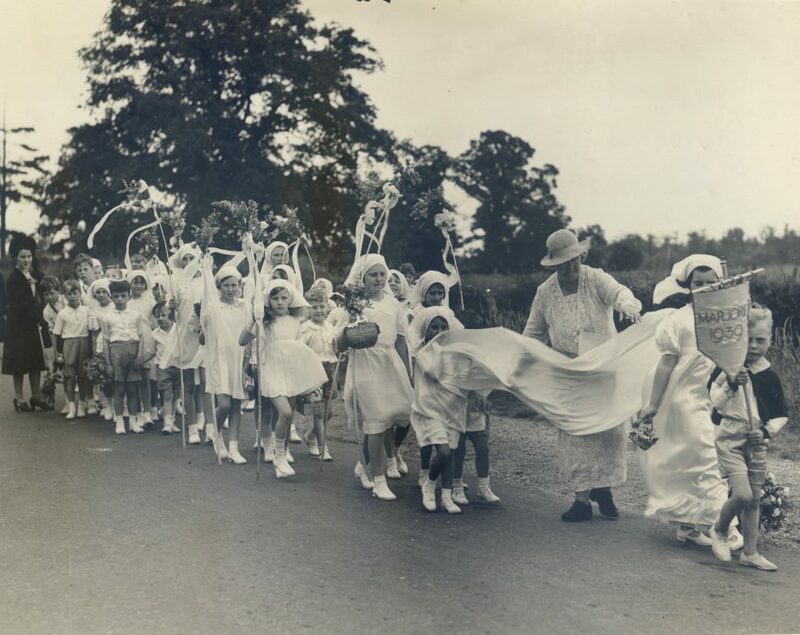 Marjorie Guest gets one mention in the school diaries on 18th July 1940 when it is noted that she is away for four weeks, pea picking. 13; Pauline Galpin, Second right. 21; Lily Johnson centre, Evelyn Phillips, right. 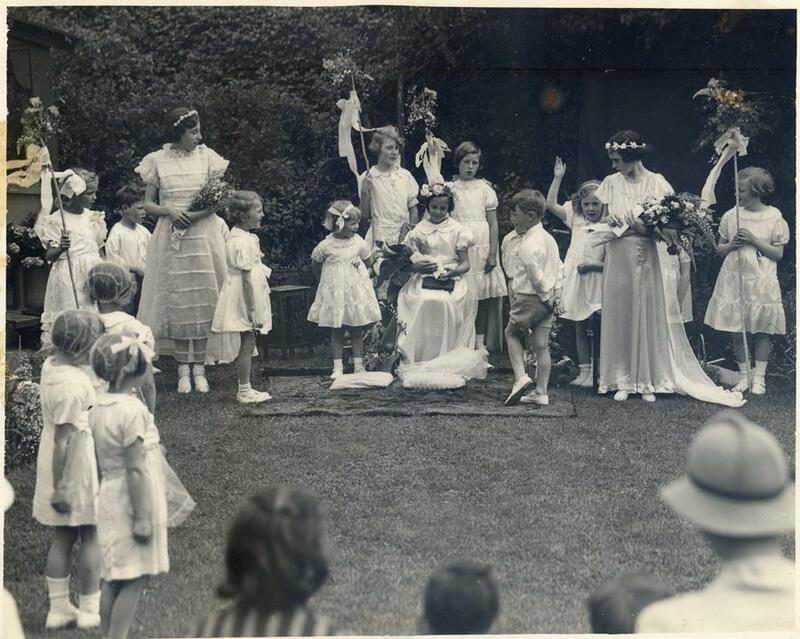 Evelyn Phillips started at the Noak Hill School on 1st April 1935 and left on the 2nd September 1941. She went on to St Edwards School in Romford. 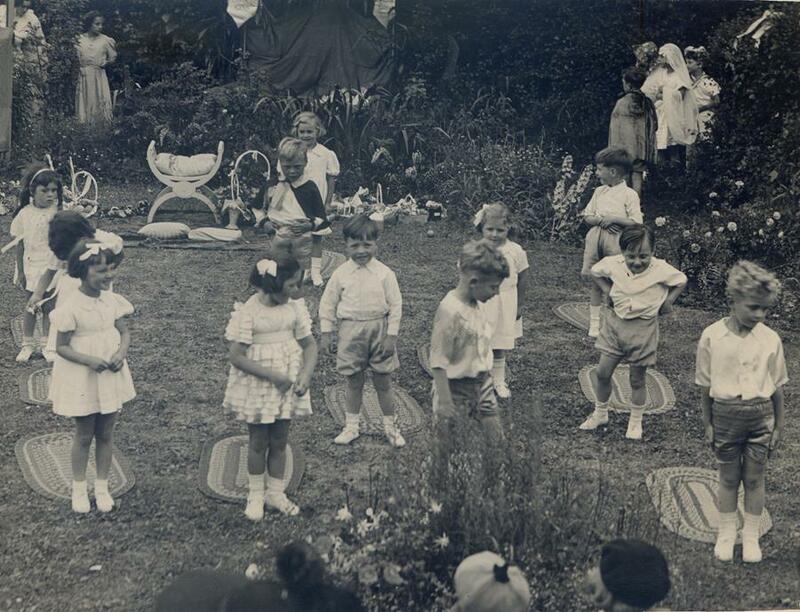 22; Rear of Noak Hill School, probably the School House garden. 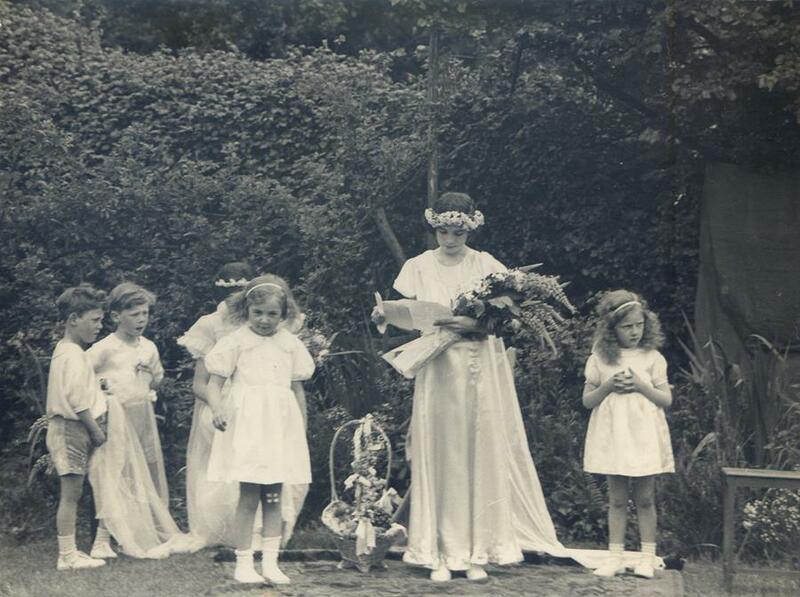 25; Iris Fogg (with long train) Maid of Honour, Joan Lodge with tambourine, Ethel Rawlings and Margaret Hollick with drums. 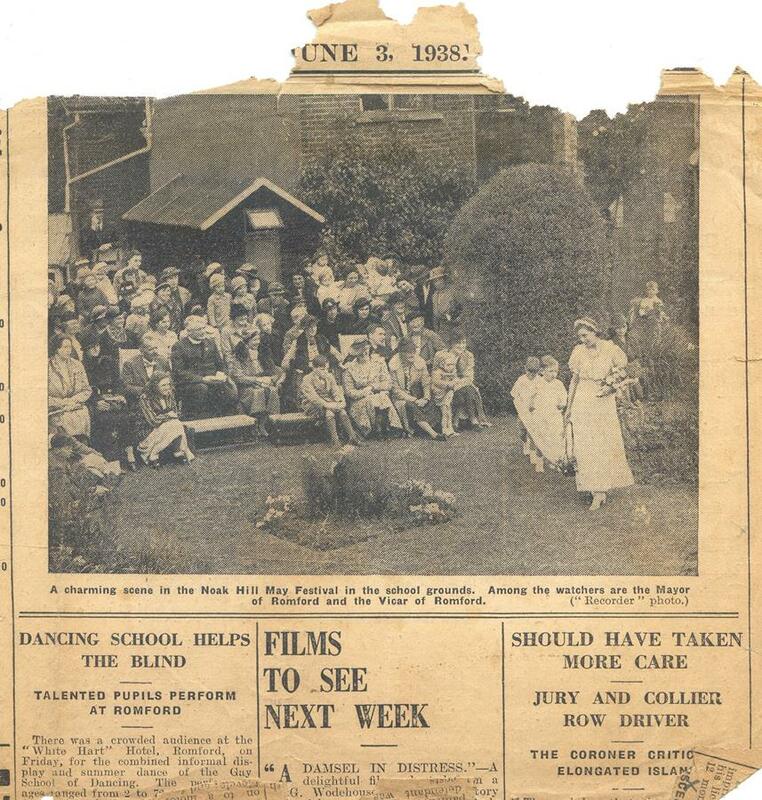 35; Local newspaper cutting, June 3rd 1938. 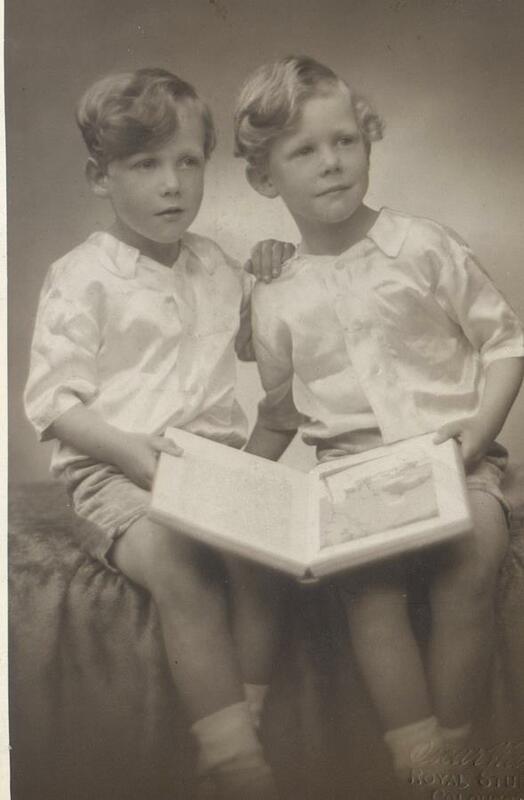 The Twins Leonard and Douglas Jupp started at the school on 18th March 1935 and they were commended several times for their school work. 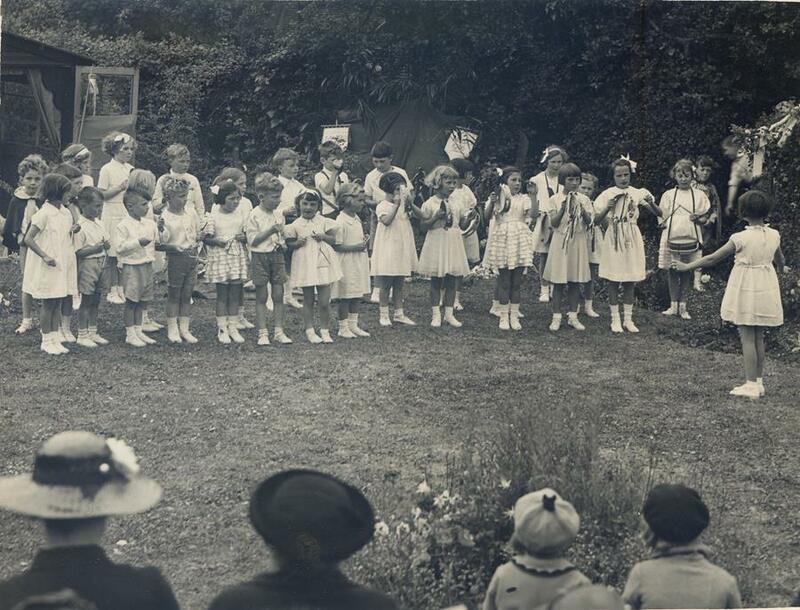 Their mother became a part time teaching assistant in November 1941. She lived in the Schoolhouse and was occasionally called upon to provide hot water to the school when the school facilities let them down. 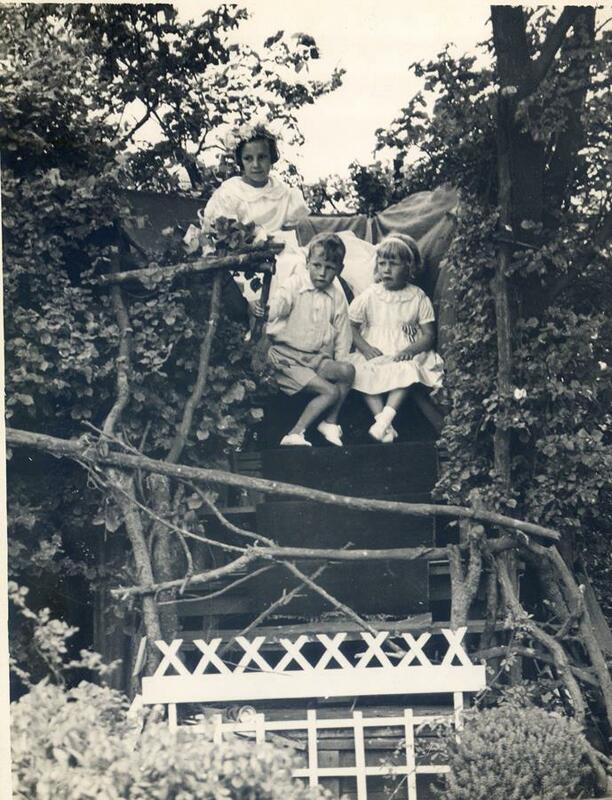 She also shared her air raid shelter with children and staff during the 2nd World War. It is documented that a Leonard Jupp was the Noak Hill Church organist during the 1940's. It is highly likely that he was the twin's father. But it is just about possible that the Leonard Jupp in question was one of the twins, in which case he would have been a very precocious teenage organist, but my money is on his dad. Don Tait has provided the following information on the family. 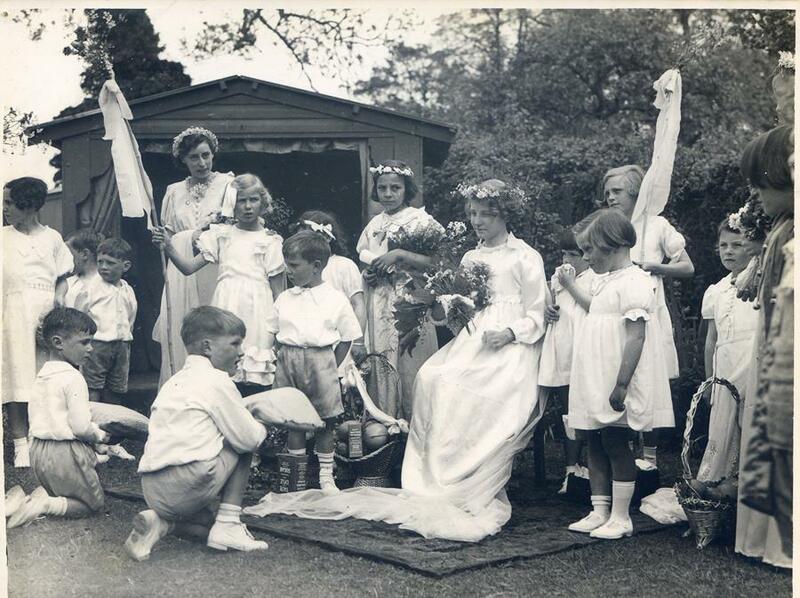 Leonard Percival Jupp married Maude Matthews in the Romford district in the June Quarter of 1916 (not at St Thomas' ) and if I have it right they had six children, all boys. Their second child, Anthony Charles Jupp was born in 1919 (birth registered in the Romford district in the September Quarter 1919). He was killed in action on 9th April 1941 when serving as a Flight Sergeant, Wireless Operator/Air Gunner, 7 Squadron RAF. Anthony Jupp is buried in Reichswald Forest War Cemetery. The image below was kindly given to us by Colleen Mason nee Milsted. She also shared some of her schoolday memories. 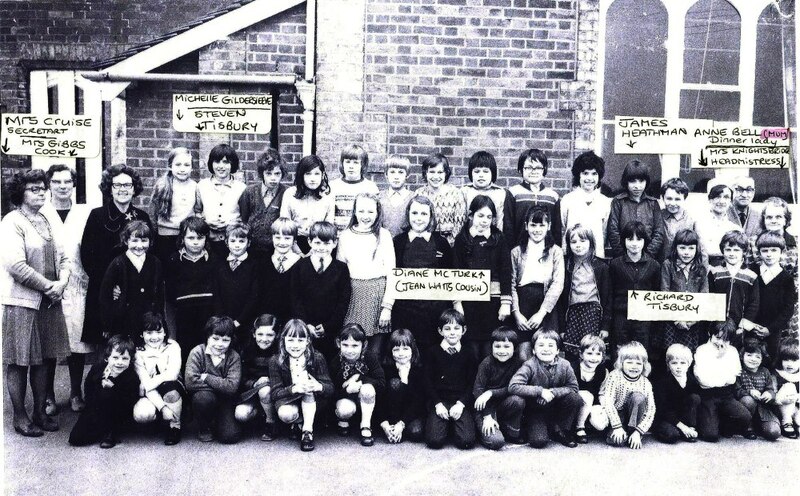 The picture, taken in 1946 shows her standing in the middle row, fourth from the right and just behind and to the right of Mrs Lock the Head Teacher. Colleen lived at 7 Noakside on the Noak Hill Rd next door to the thatched cottage which was then a general store and post office run by “The Knotts”. She says that her recollections of those times are "a bit rusty as I was very young" being born in 1938. 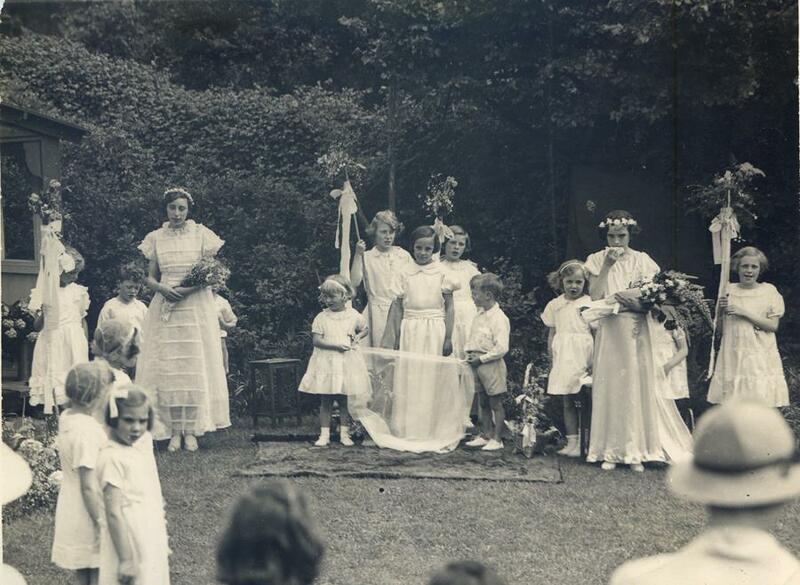 She was christened in St Thomas’s church in the village and her grandmother was buried in the same churchyard in 1940. 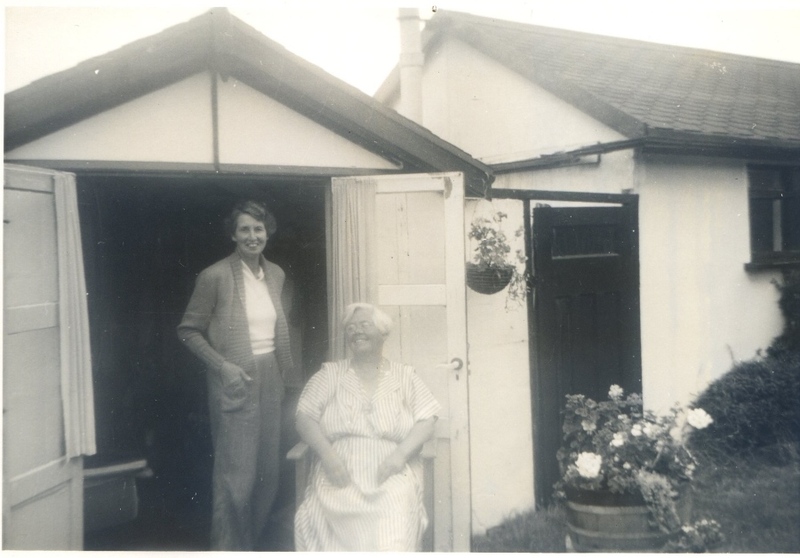 She left Noakside in 1947 when her parents sold the little bungalow and the family moved to Bournemouth. She said that she started at the village school when she was four and a half and she remembers lots of bombs dropping. She said she “saw a spitfire chasing a doodlebug one night and the bomb landed a couple of fields away. 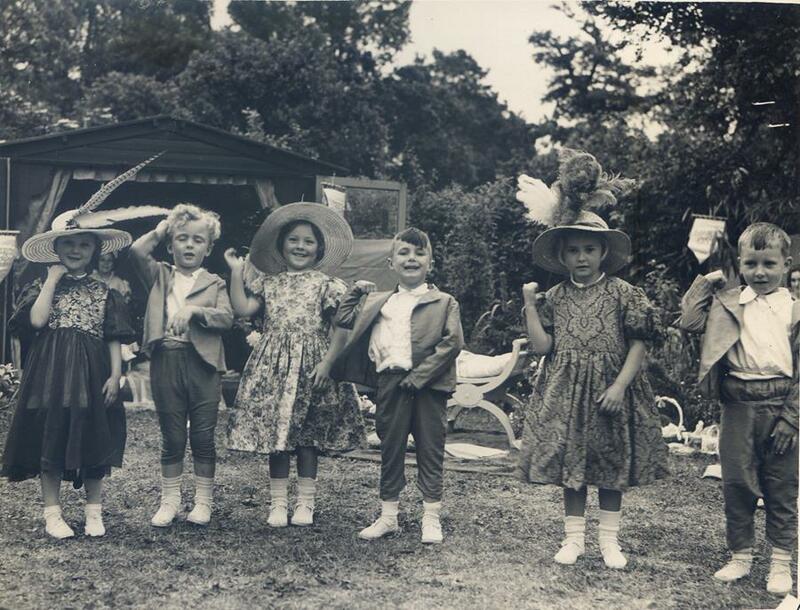 Another time she says "we were all just getting off the bus at 8.50 to go into school and a bomb dropped in the field over the way, the blast pushing us all down the steps onto the path.” She continues “We had a land girl living with us during the war as my dad was away in the army for 5 years. Her name was Barbara Wingfield and she used to deliver the milk in churns (I think) from one of the farms up and beyond the village. I remember Mrs Jupp. She used to listen to me read. 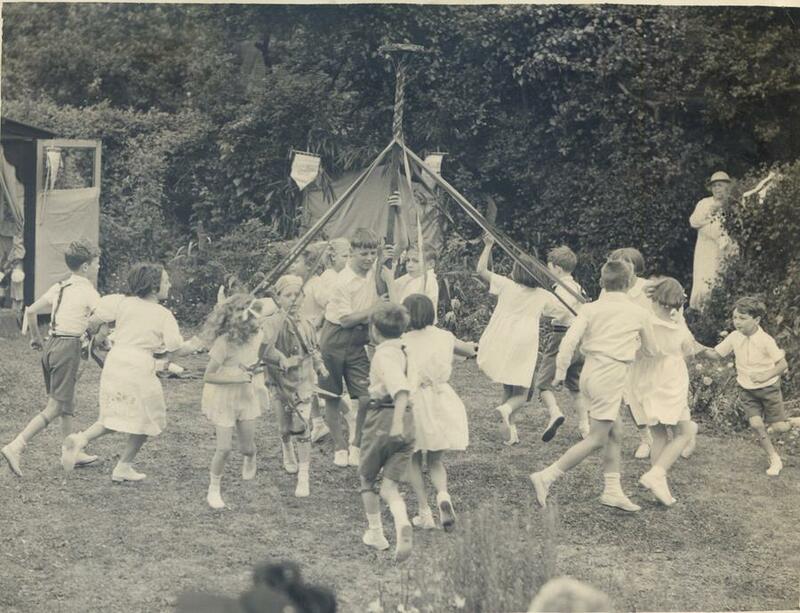 I remember going to a fete held at The Priory. Did it belong to the Neaves? 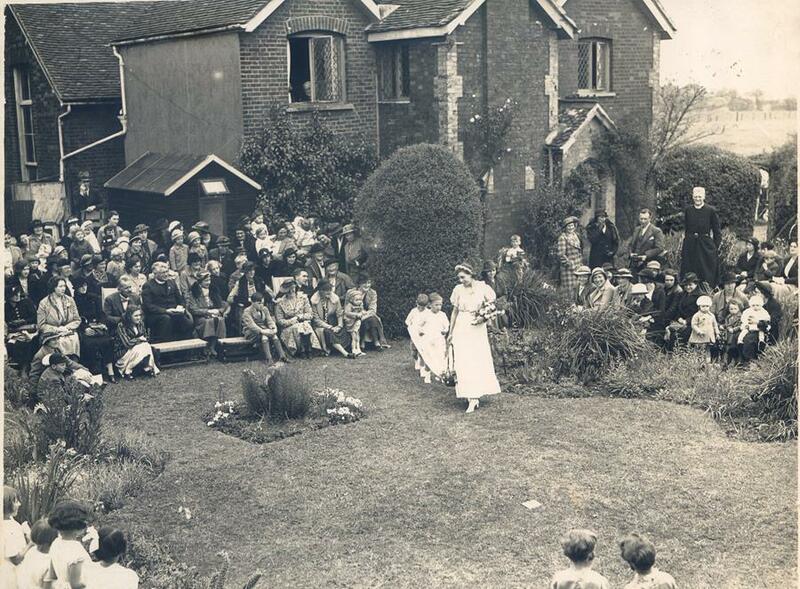 I think after the war, most of the families who lived in the few houses just along from ours were rehoused in Council Houses say at Collier Row or was it Wood. 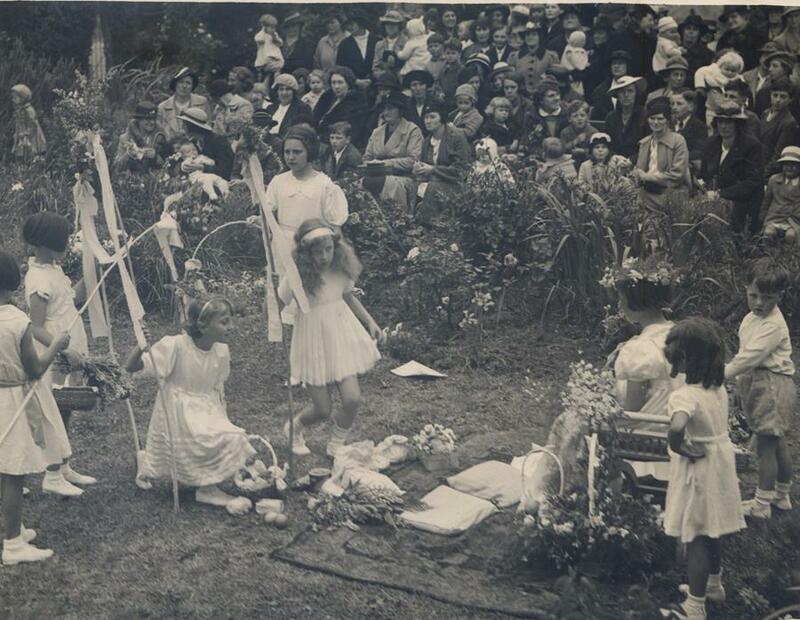 I think that’s all I can recall"
"Colleen’s Grandmother, Anne Elizabeth Thompson was buried on 30th September 1941 aged 61 and the vicar conducting the service was Fred J. Perry who at the time of the funeral was the priest in charge. 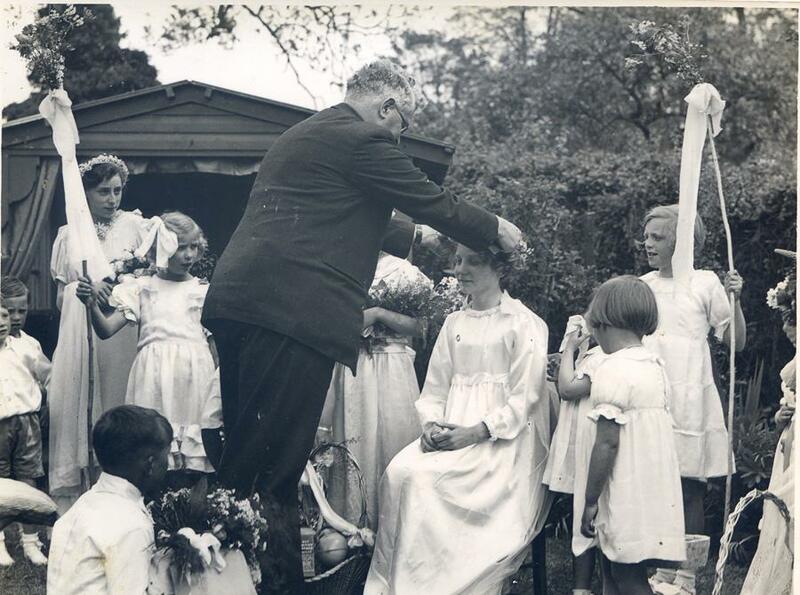 As for her baptism this took place on 20th March 1938 with the same vicar officiating (interesting to note that the entry shows her surname as Milstead not Milsted but this would have been down to the vicar misspelling the name). Rev Gaze's name first shows an appearance in 1944 in the burial book but at the time he is noted as being a curate not the priest in charge - although he arrived in Romford in 1941 and served in that area he may have officiated at services at St Thomas' when the need arose, as well as paying visits to the school in the village but it was not until 1944 that he was asked by the vicar of Romford to take charge of the Noak Hill and Romford Common areas that were within the parish.. Her father's occupation at the time of Colleen's baptism was that of a automatic meter collector (whatever that was ). The Mrs Jupp that she mentions officially joined the staff of the school as a supply teacher on 17th November 1941 but she had been at the school prior to this date as her names pops up now and again. 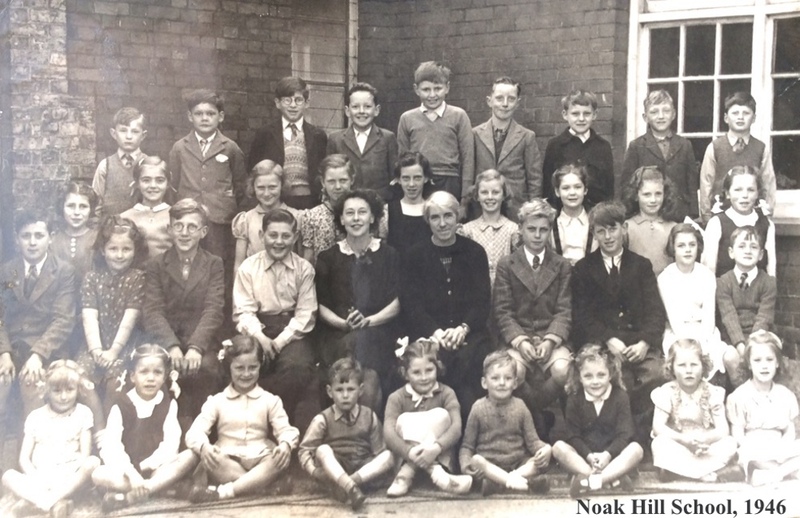 Mrs E. M. Lock took over as head teacher to the school on 1st March 1943"
Below a set of photos of the school children including some staff and the last head Mrs Knightsbridge. 1968/9. Thanks to Angela Beecham nee Bell for photos. Above Mrs Knightsbridge, Headmistress far left. Below from left to right, back row Mrs Cruise (secretary) Mrs Gibbs (Cook) Mrs Millward (teacher) Michelle Gildersleeve, Steven Tisbury, John Watkins, Sylvia Hogarth, Unknown, Philip Jones, Deborah Hurley, Mark Smythe, Luke Strutt, Gillian Watkins? 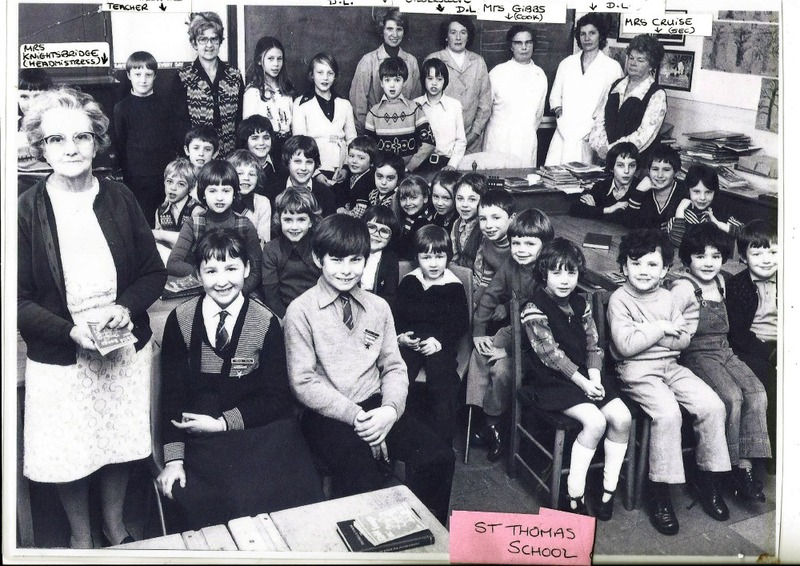 James Heathman, David Proctor, Mrs Anne Bell (dinner lady) unknown man, Mrs Knightsbtidge (head). 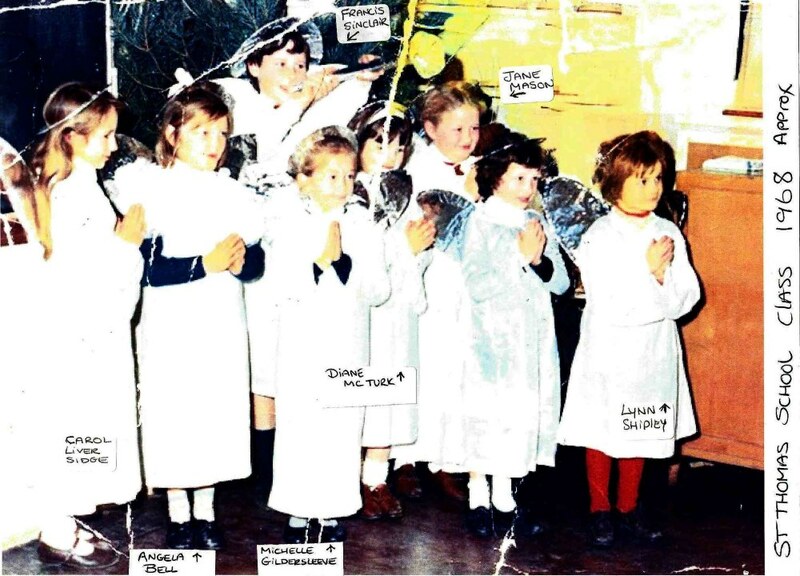 Middle row, tall girl, white jumper, centre, Elaine Proctor. Diane McTurk and Richard Tisbury labeled.